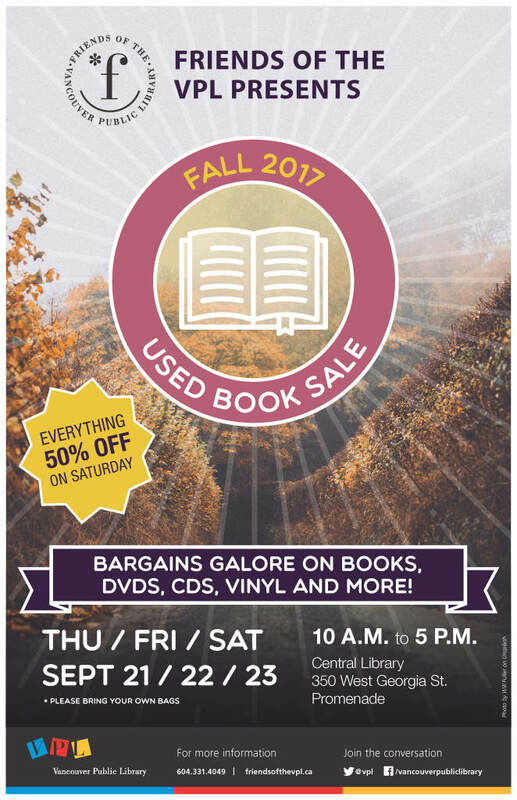 The Friends of the Vancouver Public Library’s Fall Used Book Sale is coming soon! Choose from a wide variety of gently used children’s and adult books, CDs, DVDs and vinyl, all at great prices. Thursday, Friday, and Saturday, September 21 – 23, 10am – 5pm, at the Central Library, 350 W. Georgia. Everything half price on Saturday! Please bring your own bags. For more information, contact friends@friendsofthevpl.ca or 604 331-4049. Proceeds from the sale support special Vancouver Public Library projects and programs. « Friends Super Spring Book Sale! » book’mark Annual Member’s-Only Christmas Sale! The Friends of the Vancouver Public Library are a community of library lovers who volunteer, fundraise, and advocate in support of the Vancouver Public Library. Copyright © Friends of the Vancouver Public Library.